There is an interesting paradox regarding the people of Emilia Romagna: the constant striving for and achievement of excellence, combined with an overwhelming sense of humility. This comes from the region’s geographical history as predominantly agricultural terrain, meaning large farming communities nurturing animals and the earth. The people of Emilia Romagna are not of aristocratic descent like the Piemontese or Tuscans and are therefore not familiar with pomp and ceremony with the resulting displays of pride and active self-promotion. They are renowned for their passionate work ethic and it is certainly no coincidence that the region is home to several ‘valleys’ of worldwide excellence: food, motors, packaging and prosthetics. There is an innate sense of forever improving what has been done before. The fact that that some of the world’s most famous food products such as Parmigiano Reggiano, Prosciutto di Parma, Aceto Balsamico, Culatello di Zibello , to name but a few, come from Emilia Romagna, with few people being aware of their regional heritage, is certainly testimony to the region’s humility. After the two earthquakes that hit the Modena and part of the Bologna province in 2012/2013, thousands of wheels of Parmigiano Reggiano, bottles of Lambrusco and Aceto Balsamico were destroyed (among many other local food products), leaving producers with little alternative, except to sell off what could be sold at low prices and roll up their sleeves and continue to make the best possible products even better, without looking back or wallowing in self pity. The Emilia Romagna region produces a staggering 41 PDO and PGI food products whose international excellence speak for themselves. And it is only in recent years that both the region and the producers together with their relevant product consortia have been actively promoting their products, creating a conscious link in the minds of international consumers with the region. Since Etruscan times, wine has always been at the tables of the people of this region, produced by farmers and of simple quality. Over the last fifteen to twenty years, however, the region’s wine-growers have moved forward in leaps and bounds in terms of quality. And it is not only the international wines (Sangiovese, Cabernet Sauvignon, Merlot, Sauvignon Blanc and Chardonnay) that are now being produced to excellent standards and in blind tastings compete, very successfully, with some of the most famous and renowned Italian wines on the international market, but also some of the region’s autochthonous (indigenous) wines, such as Pignoletto, Albana, Ortrugo, Gutturnio, Malvasia di Candia and, of course, Lambrusco, are gaining recognition in award-winning restaurants all over the world. In fact, in 1987, while the famous Tuscan and Piemontese reds were basking in their already acquired DOCG status, Romagna’s Albana (white) was the very first white wine in Italy to achieve DOCG status, a fact that seems to be largely overlooked in international wine circles. Lambrusco is, without doubt, Emilia Romagna’s most famous wine, for the wrong reasons. During the 70s, 80s and, in some part, the early 90s, it was considered a cheap, sweet, sparkling ‘get-drunk-quick’ wine both in Europe and the USA. Over the last 20 years, however, Lambrusco producers have done their utmost, and with great success, to overturn its previous reputation, creating a large variety of different and interesting Lambruschi (four different DOC), which are beautifully balanced and of excellent quality. Lambrusco has finally become a wine with a reason. Despite the region’s food fame, the wines, except for Lambrusco, are largely unheard of. Thankfully, some award-winning and particularly curious chefs and restaurateurs both overseas and in Europe are beginning to actively promote them in their menus. One thing that stands out in Emilia Romagna, especially when visiting award-winning restaurants which could, in the first instance, predominantly feature some of Italy’s more famous wines on their menus, is that chefs, sommeliers and restaurateurs, and in particular those of international standing, are proud to present the regional wine list well before the national – or even international one, following the philosophy that ‘whatever grows together, goes together’. 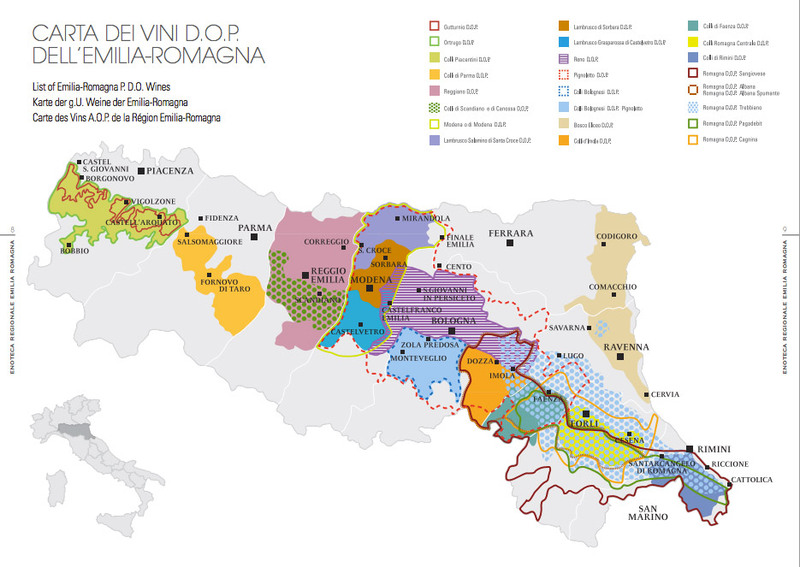 The Emilia Romagna region extends from Italy’s eastern coast and the Adriatic sea, north bordering the Veneto and Lombardy, west bordering the Piemonte and Liguria and south bordering Tuscany, the Marche and the Republic of San Marino. The largest wine-producing areas are in the plains, but it is the wines produced in the region’s many hills that hold their own fascination, with a large variety of very different terroirs that create an array of wines with their own unique characteristics. 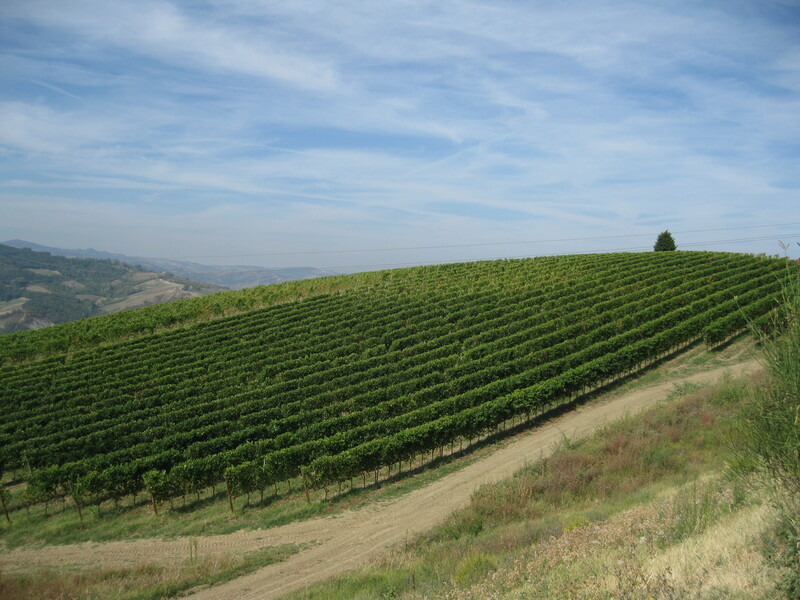 Thanks to the height of some of the hills (often 400m plus above sea level), many vineyards do not need to use classic pesticides, due to the fact that many vine-destroying pests and insects cannot survive at this height. If you don’t know where to start with the vines and wines of the region, here is a brief overview of some that shouldn’t be missed and their ‘home’ province growing areas. The regions second DOCG, awarded in 2010, Pignoletto is a white, beautifully and lightly aromatic wine with high acidity and hints of hawthorn, elderflower, acacia, pink grapefruit and almond, successfully produced in still, sparkling and spumante versions. It is religiously paired with Tortellini or Passatelli in Brodo, Mortadella, Tagliatelle al Ragù and other fatty and pork-based antipasti, primi and secondi. Pignoletto ‘experts’ and most wine producers tend to favour the still version, however, the excellent sparkling version is slowly but surely gaining very positive international recognition as a delightful alternative to Prosecco. There are various DOC Lambruschi – three in Modena alone, which are those we have chosen to outline. Each Lambrusco ‘sub-type’ has its own distinct characteristics and is produced in various areas of the Modena provinces. Lambrusco di Sorbara is probably considered the ‘definitive’ Lambrusco and has a light ruby or garnet red colour and is produced as dry, semi-dry, semi-sweet and sweet as well as red and rosé, frizzante and spumante versions. It is medium-bodied and has aromatic hints of violet, raspberry and wild strawberries. Lambrusco Salamino di Santacroce, with grapes that are shaped a little bit like salami (hence the name), is intense ruby or garnet red in colour and generally dry or semi-dry but also available in semi-sweet and sweet versions. It is full-bodied, tangy with good acidity and has aromatic hints of ripe red fruit and jam. It is produced mainly as a red, but also as a rosé wine and comes in ‘frizzante’ and ‘spumante’ versions. Lambrusco Grasparosso di Castelvetro has an intense and dense ruby colour and is produced in red and rosé, frizzante and spumante versions. It is usually produced as a dry wine, although, following the Lambrusco tradition, it is also vinified as a semi-dry, semi-sweet and sweet wine. It is well-balanced and has good mineral undertones. On the nose it is probably the most complex of the Lambruschi, featuring distinct aromas of red and black berries, wild strawberries, pomegranate, dog-rose and herbs. All Lambrusco types are typically served with the local cuisine – hand-made pasta, local charcuterie, pork dishes, boiled meats and grilled meat. 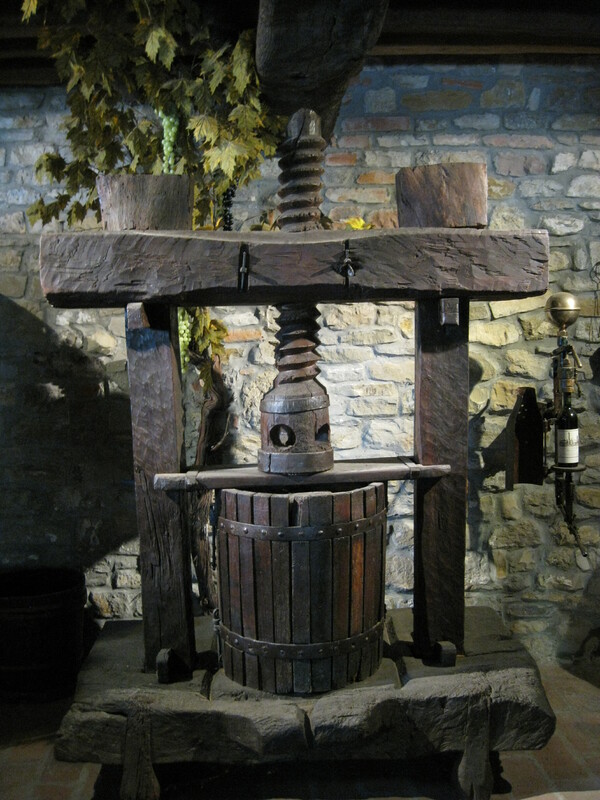 (Lambrusco grapes are also used to make the Aceto Balsamico Tradizionale di Modena PDO). Very few people know that Albana was Italy’s very first white DOCG wine, receiving its DOCG status in 1987, when only the ‘famous’ reds enjoyed the same status. This is a very aromatic wine whose name stems from the latin ‘Albus’, meaning ‘white of excellence’. It is produced in several versions – dry, amabile, sweet and passito and sometimes in sparkling and spumante versions – so it is extremely versatile. The overriding aromas are floral (acacia and lime blossom), slightly spicy, citrus fruit (lemon and grapefruit) and the sweeter versions feature apricot, peach, apple, pear and other yellow/white fruit aromas. It is often paired with pork-based antipasti, cave cheese from Romagna, pasta dishes and some fish dishes and the sweeter versions with cheese platters and dessert. This is the Tuscan king of grapes and most certainly the most widely-grown grape in Italy, but also extremely popular in the Romagna area which claims its origins. The Sangiovese di Romagna makes a beautiful medium-bodied red wine with some hints of mineral and good tannins. The name of this grape stems from a monastery near Rimini on mount Giove and it was spontaneously ‘baptised’ Blood of Giove or ‘Sangue di Giove’ by a Franciscan monk in the middle-ages, when the monastery hosted a noble guest who asked its name. On the nose, the overriding aromas are of violets and forest fruits. It has soft tannins and is produced in both a classic, superiore, riserva and novello versions. It is typically paired with local charcuterie, meaty ‘primi’ and meat-based ‘secondi’. Perfect with boiled meats or lamb. An unusual white wine whose roots date back to pre-Christian times. This vine was one of the few that survived the Phylloxera epidemic during the second part of the 1800s. Originally it was blended with another grape from the area – the Malvasia di Candia Aromatica, but in the early 1970s a producer decided to vinify it by itself with excellent results. It is produced in sparkling, spumante and still versions. On the nose the aromas are delicate and distinct (hawthorn and acacia) and in the mouth it has good acidity, is dry with a distinct mineral element which leave a slightly bitter aftertaste. Considered to be very versatile, it pairs well with the local charcuterie, pumpkin and fish based ‘primi’ and vegetable and fish-based ‘secondi’. Gutturnio is one of the few wines of the region that is a blend of Barbera (predominant) and Bonarda (Croatina). It was originally vinified as a sparkling wine, but is now produced in still and riserva versions. The two grapes are fermented and vinified separately and then blended. On the nose its prevalent aromas are of dark fruits and some spice and barriqued versions obviously feature some tobacco and wood aromas with distinct tannins. Good pairings are ‘pisei e fasò’ a local bean and pasta dish, gnocchi with cheese, truffles, ravioli and braised meat dishes. A white grape and sub-category of the Malvasia grape (of which there are nearly 20 varieties in Itay) and, as the name suggests, very aromatic. Originally produced as a sparkling version, it is now successfully produced in both still and ‘passito’ versions – the latter of which is very popular with typical cakes and desserts of the area. Typically, the sparkling versions are dry and slightly acidic and on the nose very aromatic reminiscent of white flowers, almonds and grass. This pairs well with local pasta dishes, charcuterie and cheese. The passito version has overriding aromas of dried apricots, figs, dates and almonds and caramel. Yummy Italy organises wine tours to select vineyards which choose either organic or natural production methods. Click here for more information. Helena Kyriakides is from London, England, but has been living in the hills of Bologna for the last 15 years. She is a member of FISAR (The Italian Federation of Sommeliers for the Restaurant and Catering Industry). She is also a Traditional Balsamic Vinegar of Modena and Parmigiano Reggiano taster and a well-established gastronomy guide and food consultant. She can be followed on Twitter @TrueYummyItaly. 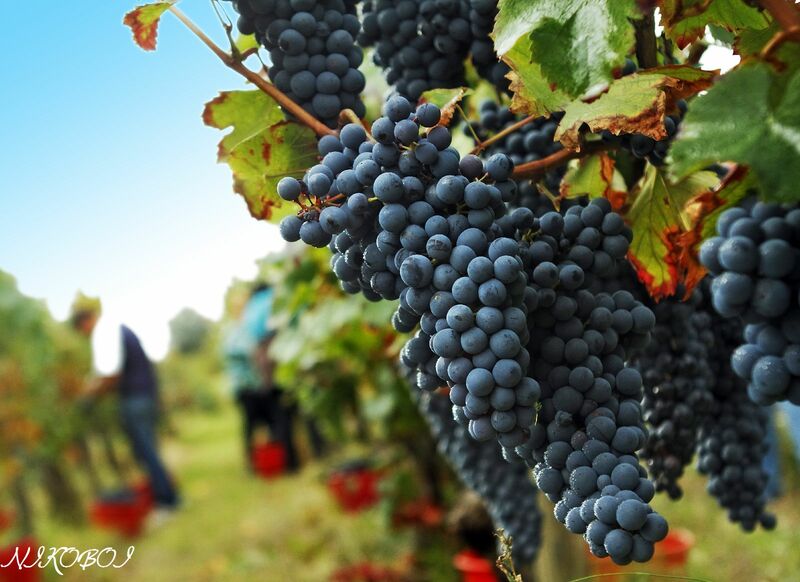 Thanks to Nicola Boi for the Lambrusco grapes photograph. All other photos are the property of Helena Kyriakides.